When you set off for college, did you have dreams of making the world a better place? Perhaps your dreams led you into a career in best chandler denstist – fields that aren’t known for their large salaries. If you attended a private school and borrowed a substantial amount of money to fund your goal of helping your fellow man, you might be left questioning if others need to help you. Has Your Dream Always Involved Helping Out? Perhaps you dreamt of serving your community, but opted for a more lucrative degree in something like engineering or business. Even though you have a decent paycheck, you might also have hefty student loan debt. Your eyes wander to the job postings for nonprofits, but you know you’re financially better off with your current employer. Or maybe you do find yourself serving your fellow man as a doctor or cosmetic dentists. You earn a decent salary, but the student loan debt weighs you down. Some days you wonder if your career choice was worth it. No matter the situation you find yourself in today, if you want to serve your community, you shouldn’t let your student loans hold you back. The good news is serving others can actually help you pay off your student loans. In some cases, you can have your loans completely erased. In other cases, your unpaid service can contribute toward paying off your student loan debt. 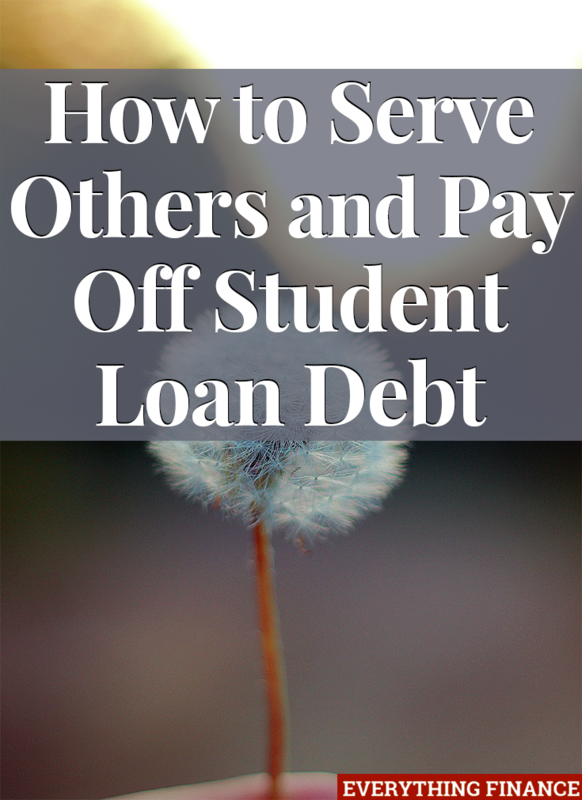 Let’s take a look at how you can serve others and pay off your student loans. If you have federal student loans, you have the most options for turning your service into student loan help. One option is the Public Service Loan Forgiveness program. In order to qualify, you must have Direct Loans under the William D. Federal Direct Loan Program. If you consolidated loans into a Direct Loan, the consolidated loan also qualifies. Additionally, you must work for the government (federal, state, or local), certain non-profits, or serve in the Peace Corps. After you make 120 qualifying payments, the balance of your loans will be forgiven. ** Note that using the 10-year standard repayment plan amounts to qualify means that you will have no balance left to forgive after 120 qualifying payments. The details of these payments plans are beyond the scope of this article, but note that your payment will generally be limited to around 10% of your discretionary income. Your discretionary income is calculated based on your family size and your state. The US Department of Education offers a payment calculator here to help you determine what your new payment might look like. If you’re a teacher, you might also be eligible for the Teacher Loan Forgiveness program. In order to qualify for this program, you must meet certain expectations as a teacher, the school you teach at must also qualify, and you must teach under these requirements for 5 years. Because of the criteria that need to be met, you’ll need to complete an application for the program so that all the qualifications can be vetted. You don’t need to sign up for one of the alternative repayment programs, though you may find they offer some additional benefit for your checkbook. Note that the Teacher Loan Forgiveness program credits you a maximum of $17,500 if you have Direct Loans or Stafford Loans. PLUS loans are ineligible for forgiveness under this program. On the other hand, Perkins loans may qualify for a total cancellation. Perkins loan cancellations are not only offered to teachers, but to other qualifying service professionals. These professionals include PeaceCorps or Vista Service volunteers, armed services members, law enforcement officers, nurses and medical technicians, Head Start employees, and early intervention specialists. For each year of service, a portion of your Perkins loan(s) will be forgiven. For exact details you need to contact the school that provided the Perkins loan(s). Are you a doctor, psychologist, nurse, or other highly paid service professional? You have additional options. The Health Resources and Services Administration (HRSA) of the US Department of Health and Human Services offers several programs for which you might qualify. HRSA oversees the National Health Service Corps, which was established in the 1970’s and provides scholarships to students currently enrolled in medical, dental, and mental health programs. The scholarships are highly competitive, but the Corps also offers a loan repayment option that’s less competitive. By agreeing to serve at a “high-need” site full-time for a 2-year term, clinicians can receive $50,000 in student loan repayment aid. The clinician might be eligible to apply for additional years, resulting in further payment toward their student loans. The Corps also offers the “State Loan Repayment Program” which is available to clinicians who serve a health shortage area in their state. Exact details of qualification and repayment vary by state; not all states have this program. Nurses have the option to participate in the NURSE Corps Loan Repayment Program. The program is available to any licensed registered nurse, including advanced practice nurses like nurse practitioners. By agreeing to work in a “Critical Shortage Facility” for 2 years, the nurse will have 60% of his or her qualifying loan balance paid off. Critical Shortage Facilities include rural heath clinics, public hospitals, hospice programs, and nursing homes. If the nurse signs up for the optional third year, an additional 25% of the student loan balance will be forgiven. Finally, the HRSA offers the “Faculty Loan Repayment Program” to health professionals from disadvantaged backgrounds. In order to qualify, the borrower must use their health-related degree to serve on the faculty of a college or university preparing future clinicians for the field. For 2 years of service, participants will receive $40,000 toward their loans, plus a tax benefit. Over the last 5 years, a number of organizations have formed with the goal of increasing volunteerism and social impact while also allowing college students and alumni to pay off their student loans. The following organizations work with federal and private loan borrowers, and your current profession or employer is immaterial. Essentially, this option is available to everyone. While the following organizations pay the student loan companies directly, you might still have tax implications depending upon the amount you earn. Consult a tax professional for more specifics. As noted above, SponsorChange accepts enrolled college students as well as graduates. The participants are called “change agents” and the sponsors are called “Philanthroteers.” Service projects are posted, and Philanthroteers review the projects and sponsor the ones that resonate with them. Change agents complete the project, earning money toward their student loans. The money earned is paid directly to the student loan provider. Currently, SponsorChange says that change agents can expect to earn at least $200 for around 40-50 hours of service, which is usually spread over about 3 months. SponsorChange was originally tied to certain geographical locations, but is now nationwide. ZeroBound is a service-based crowdfunding platform. Anyone with student loan debt from attendance at a US college or university can participate, whether they’re currently enrolled or have been in the past. While qualifying schools must be in the US, you don’t need to live or serve in the US to use Zerobound’s platform. If you currently serve an organization, you can use that service as part of Zerobound’s platform. Otherwise, Zerobound can connect you with organizations that can benefit from your skills. You can tap anyone to contribute, including friends, relatives, coworkers, etc. However, Zerobound provides additional support for your platform by bringing in sponsors. On top of volunteering, you’ll want to provide updates for your campaign to drive more engagement. At the end of the campaign, any funds raised, minus transaction fees, will be transferred directly to your student loan company. Note that Zerobound is in the beta phase, so they have limited opportunities at this time. StartNoo is brand-new to the volunteer-for-student-loans scene. They’re currently operating with a small test group and plan to open their platform to other users later this year. As with SponsorChange, any student or former student with student loan debt can participate. Payments go directly to the student loan servicer. The intent is to provide volunteer opportunities, though you can submit a request to add an opportunity if you have a relationship with an organization. You want to serve others and you want to pay off your student loans. Find a way to marry those two goals and you’ll change the course of your future, if not the world.